The above is Jennie having way too much fun with her art program! What a mess! The ifish burgees are in! Please order them from Karyn at Scappoose Outfitters. While you are at it, customize some ifish clothes! Order a tee shirt, a sweatshirt, or one for your whole family! That way, you'll be ready for the ifishstock party! The chatter on the burgees and a picture of them are located, here. Please take a moment to read Stan's new column. I just put it up this morning. It's nice to look forward to the first of the month. I love being the first to wish folks a Happy first of the month. I giggle when someone else beats me to it! Not only is it one of many chances to for all of us to start fresh, but in doing so, we have Stan's column to look forward to! His wisdom gives us greater chances to start fresh with the fish, too! Stan always has great ideas, new products, and tips to get you into those "finny critters with the big mug". I love Stan's casual way of meandering through words that help us learn a slice of what he knows about bass. He's a clever sort! And if there's one thing Stan knows... it's bass! Often folks on ifish pick up his bass column and apply what they've learned to salmon, steelhead, and trouts! I know! I've done it, myself! Please continue to enjoy Stan's column at ifish! Got thoughts to share on bass or panfish angling? Stan welcomes your e-mail comments. His address is [email protected]. Last night, before I went to bed, I felt it! Just a tinge of it, though, and I thought, "Noooo... It can't be!" It's only August, and it must be just a cool front coming through, tonight. But then I woke up, and it's absolutely undeniable! It's coming! I don't know, but the feeling of Fall just makes me giddy! Get ahold of yourself, girl! Summer still has a while to play out! But the blackberries are ripening, and... and... !!! This morning, there is a light fog over the valley. The tips of the tree are hidden in a white soft blanket and the sun is shining through on the very top! But, the sky above isn't the same deep blue of spring/early summer. It's a light, powdery hue of blue. Now that I have but one eye, I try hard to remember in words, in my brain, exactly how every season looks. I wonder sometimes if that's a bit much. All I have to do is open the door and it hits me in the face and on my cold legs. Brr! That brisk, cool excitement! I had just washed my robe last night, and it was laying in the dryer, cold. As the waggly tailed dogs waited for their treat, I turned the dryer on. In the doggy cupboard, I have five or more kinds of treats, and I have so much fun 'treating' them in the morning! Afterwards, I opened the dryer and wrapped that big, heated, soft robe around me. It was absolutely delicious! A cup of coffee waited around the corner. I was set! What could be better? What a morning it is! I sit here with the window cracked open just a bit. It's the same feeling I remember about fishing in Alaska. I had three down comforters over me at night, and all the windows open. Luxury! Pure luxury! All this, and the excitement of fish awaiting me in the morning! Oh, Heavenly Father, thank you for this world! Thank you for the opportunity to stand, knee deep in your cool clear river and cast a dry fly towards a leaping salmon in the Fall. Not to catch the salmon, mind you! But to feel the strong, aggressive take of a cutthroat trout, nearby it! My desire to go after the beautiful salmon in the Fall has lessened, after last year's heavy traffic on the Kilchis river. Cutthroat trout in the Fall are my absolute favorite! OK... all dreams aside, I do have work to do. But, you know? There is nothing like taking time out for thanks, before diving in to responsibilities. The world, and all that is in it, is good. Indeed, after the chilly morning that reminded me of Fall, we have rain. O.K.! Pull up! I didn't want that much of Fall! That is, of course, unless you want to give me some chinook with that, please! The first real rain of Fall is exciting. Rain in August? Not so much. It all happened at the Christmas Party a couple years back. A party where we all get together, bring toys for the kids at Emanuel Hospital, and celebrate Christmas with too much Pizza, and a whole lot of smiles and tears. That next Valentine's Day, I received the cutest bear in the mail, in thanks for being a match maker. Today I will be traveling across 53 to their wedding. I am so excited for them! Finally, I'm into the summer groove on fly fishing. It took me a while, this summer, but now I've got the fever. No fish for the last couple of nights, as three nights ago, I lost my beloved spruce fly that hooked way too many cutthroat. A very large monster from the deep came up and nearly pulled me in. After I regained my balance, I checked my line, and came up slack. I reeled it in and the knot was still perfect. A few inches down, the line was abruptly cut. Something lives in the deep, there, that is too large for 2 pound tippet! So, if anyone knows where I can get a magic spruce fly with the shiny green body, I want one! I only had one, and it's gone! Buried deep in the corner of the mouth of a huge cutthroat, or perhaps a summer steelie? Who knows. It's part of the magic of fishing: The unknown! Here, here, though, to Andy and Jen! 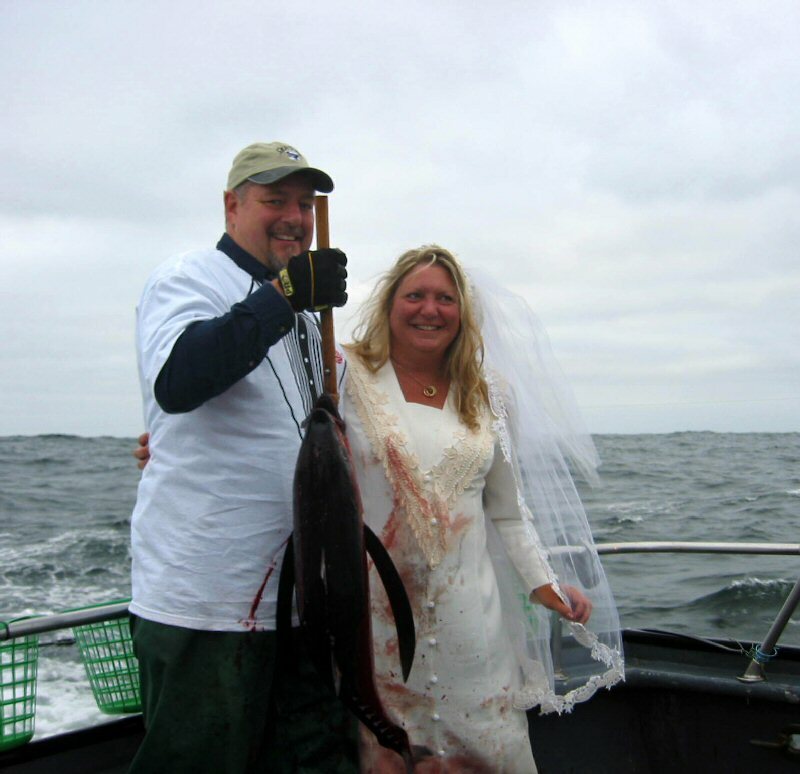 May they have a long and happy life together, and may their journey be filled with love and of course many, many days of fishing! Speaking of such, I sure miss Mr. Rogers. What a delightful man! Yeah, we all made fun of him, but you know, listening in the background while I folded laundry, or whatever, my kids stared at the television, open mouthed and in a trance. I couldn't help but catch his quiet enthusiasm and kindness. Pretty hard to go about your day after listening to Mr. Rogers, with anything but a soft voice. He set the tone. Nowadays, the only thing that matches his show and sets my tone as well, is peace and quiet. The sound of the birds in the forest and the river singing it's quiet, late summer song. Fall is coming. You really can feel it, now. Trout Girl wrote me a private message on ifish. She also celebrates the coming whisper of Fall. She writes, "I love fall. I love the golden light. I love cool nights. I love the warm days. I love fishing and wandering the hills in fall. Its here." Oh, mutual admiration! The words she wrote have sung in my heart ever since. I love the "new season of adventure" and that keeps repeating itself, whenever Fall whispers in my ear. It happens when I sit on the river to watch the dogs play and a stray leaf gives up it's grip from the trees. One quiet, little golden leaf laces it's way through the sky and lands quietly on the rocks. If I hadn't seen it with my own eyes, it wouldn't have been noticed until I walked over it, and heard the familiar Fall crunch. My ridiculous bird is back! That's the dipper that sings a song so hilarious that I have to laugh. Trills that race up and down the scale chromatically like no other Sonatina ever composed! It's the most joyful song! The dipper seems to come out and celebrate each Fall with me, and stays through the winter months. My flowers have lost their spring green lush. They are beginning to go to seed, and look more like long vines. Daily, I pick off the brown. It seems early for this to happen. Some things are late, some early. The grossbeak are still here, and so are my goldfinch. According to our calendar, these birds have never stayed so late. I'm filling my sunflower feeders still, daily and I'm getting the biggest kick out of watching the parents feed their young. The babies shake their fluffy feathers, and try so hard to mimic what their parents do. They are so clumsy and cute! Claire visits me each morning and sits with me in the quiet, while the sun comes up. She's always here before me. Claire is my hummingbird. I wonder when she'll leave? I have about three left. The others come when the sun is full in the sky, but Claire.. she's an early morning riser. Ah.... I have to get to work. Coffee? Will that help? I'm feeling a little hazy dazy. I've been sick all weekend. Just ached from head to toe. My INR was really high. I didn't get to go to Jen and Andy's wedding and instead, just stayed home. I was so disappointed about that. Every day I have to get up and decide this is what it is. I enjoy what I have, and just accept what I don't. Same with what I can do, and what I cannot. Life is good. Fall is coming, and I can't wait. I'll share some of my pics, later! "That's hot" A helpful column of the hottest topics on ifish for that week. It runs on Friday! Jen (Ocean Blue) and Andy (Angler Andy) honeymoon on a charter boat out of Astoria. Oh! I doubt she'll hand down these tuna clothes! Tuna clothes are, after all... forever! Now, that's hot! Bud wins his own tournament! Read about it! What a hoot! Although Bud no longer really runs the tournament, it was his baby. He started it a few years back. Bud Hosner, owner of his own marina in Garibaldi, is known and praised as "Seelicious" and is becoming quite a hero on the ifish Salty Dogs board. Ocean fishers adore him! Order your Salty Dog Burgees, here! Scappoose Outfitters have gotten their once a year burgees in for your boat. Be known out on the ocean as one of the group! Leave no dog behind! What to do with all that tuna? It's that time of year, and people are asking. Here are some great canning tips and here are some great recipes! You've got to try the ceviche! Jen's recipe for Tuna Surprise lives on. It's one of my family favorites! Try these smoked tuna bellies, too! Ifishstock prizes are rolling in! I cannot believe the amount of prizes the members will cart home, this year! Wahoo! Many thanks from all of our members and sponsors! Without you, the member, we would not have ifish! Are you interested in a car caravan to Alaska? Many ifishers are! I sure am! I'm going to do this before my life is over, for sure! What a hoot! Can you imagine all of us on our radios? "There's a bear!" Lookie! Lookie! This post is ifish at it's finest! Gives me the warm fuzzies! Please, if you have stories and pictures like this, please, please, tell us! It's what keeps me going! Want some free stuff? Got some stuff to give away? This has become a neat thread, started by the ever generous Fishbait on ifish. He's a heck of a guy, always starting a new project, and helping others. This is a classic-"ifish at it's best", also! Fun... although not really "hot!" More like cool and crisp! I love Fall. Are you looking forward to Fall, or still waiting for summer? Just ifish chatter on "Life in General". There's much more on this forum to chat about, too! Just please, keep it civil, non political, and fun! Hunters! The online results are up! The duck hunters are feeling Fall, too! Just read this! Anticipation is in the air! Everyone is heating up for the next season! And to wrap it up, Rev and the river otter. They had a tumble in the river out back. Luckily, she isn't hurt, but boy oh boy did she yelp! I have to laugh. This morning I woke with my brain just full to the brim. I had a chaotic ifish dream last night, in which I couldn't find anything, I was late, and everything ifish was afumble. Ifish is such a busy place! I have ifishstock on my brain. I need to make a trip to Costco to get some things to make it a success. I need to settle on which software to use for the ifish business listings, and think of a name for it. For instance, is "Ifish Yellow Pages" right, or is 'yellow pages' subject to copyright? A call to my lawyer is in store. I have to write to Sharon at Steelheaders, and to Bruce at Water Ready about their pontoon donation for NSIA. How exciting! Bruce is such an awesome guy! I need to introduce to you, Bittler Bros. Sporting Goods, who have waited patiently for me to add them to our listing, over at the left, there. What a grand company, they are. So generous to ifish! They have a new web site under development. It is here! Welcome, Bitler Brothers! You wouldn't believe what they have donated to our readers for giveaways! Thank you, Bruce and Dad! Anyhow... I have a whole bunch of additional ifish things on my mind, and I was thinking, "Man... surgery will be welcome! And thus, the laughter. Who looks forward to surgery? I do! I'll tell you why. I'll have an excuse to just lay there. I'll have an excuse to have someone lead me blindly out to the river, to sit in the late Fall sunshine, and enjoy the calm serenity of a peaceful river. The kind of river that lays flat, without current and let my mind be the same. Oh! I want that so badly! Take the knife to me, now! Never mind the pain. Never mind the risk! --It will be in God's hands, not mine! I love that! Who on earth needs to be ill to have an excuse to rest? I do! Then it occurred to me, it hit me like a rock-- that 'everything is in God's hands'. DOH! Why can't I learn that lesson? "Do not be anxious about anything", Jen! But, I repeatedly hand things over to Him, and then take them back! It's a tug-o-war, and I'm so thankful He understands and probably laughs at me! I will learn, someday! I have nothing to worry about! I can wake in the morning and go sit on the river and enjoy His creation and know that everything will be taken care of! Of course, I'll have to do my part, but as long as I do, and do it graciously, with love, integrity and honesty, I can leave all worry behind! I can just do my work the best that I am able, all at my own pace, and everything will work out, fine! I am taken care of! For days now, I have put off fishing with Bill on the Nehalem. My excuse? I just had too much to do. Most of the time was spent fretting, too! Oh, dear! See that writing over to the right, there-- by Edward Abbey? Here I say that, I write that, and straight away, I act like it is not there!! DO NOT BURN YOURSELF OUT! Remember! "It is not enough to fight for the land; it is even more important to enjoy it." So, that said, I am now heading out to the river. I am going to do as it says.... "get out there, and hunt and fish, and mess around with your friends, ramble out yonder and explore the forests, encounter the Grizz, climb the mountains, bag the peaks, run the rivers, breathe deep of that yet sweet air, sit quietly for a while and contemplate the precious stillness, that lovely mysterious and awesome space." I've been ill, and on top of that, I've been diagnosed with anemia. I'm just so tired, I can't make it up the stairs. How embarrassing to take David to PSU to orientation today, and have to leave, due to my lack of energy and illness. I left without him and found him a ride home with a friend. I was so sad to miss it.-- It was so odd to leave him there at college. Kind of like practice for the day I will leave him there! I will get better. I am fighting, tooth and nail... and taking iron! Today, I had this odd thought. I was always told I'd die early, but you know what? I'm almost 50! People die at 50! That's OK to die at 50! I'm proud to still be alive! I'm old! ...and no, I didn't mean that I was ready to die, with my "almost 50" comment of August 16th. I just meant that I made it past the doctor's projected early death for me. I'm proud of that! I feel a little better, today! I've been taking iron for three days. I know it can't build up a good store of iron in that amount of time, so I don't know what to blame it on, but regardless, I'm tickled to make it out to the river, this morning! Not only that, but I pushed the canoe to the water's edge, and quietly paddled around the river. My, has it changed! There is no current, this year. It's like a bass pond. It's deep and wide, and current free. So odd! I worry about the changes. It is such a treat to stare down into the clear cool water, and discover buried treasure, and to study the river bottom, to figure out where to cast, when the fish come home, this Fall. I was excited to find an anchor on the bottom of the river, and later, Bill and I will be fishing it out. I'm glad to get that anchor back! I thought it would have been moved or buried in the fast churning currents of storm waters. A huge cutthroat trout darted under the boat while I was floating free. It was like the discovery channel! Not only that, but I am catching up on past work! Things are looking up! Ifishstock is getting hotter all the time. Look at this list of give aways! Wha hooo! I hope you'll attend! You'll be sorry if you don't! Unfortunately, it seems there is no space left to camp at KOA. You might try Fort Stevens. I know the Shilo is full up, also. But, a day trip is always fun! Plus-- you could go up or down the coast and stay. Regardless, hope to see you there! Have we broken the speed of light? Bunch of smarty pants on ifish! (laugh) No kidding... there is some intellect out there! Way past me, dude! I'm still working on my times tables. Water Ready! has donated a pontoon for ifishstock, and the proceed will go to NSIA. Put in your bid, here! Ifish at it's finest! Got free stuff? Want to pass something on? This is the ifish spirit at work! Thanks goes to Fishbait for starting this fine tradition! I have to laugh. This is the longest thread on ifish, and it's... well? It is word association! At 19k replies and 33k views, I think maybe there are people at work that are bored. Enter our photo contest! Uglygreen has put a bunch of work into these and it's FUN! Get out your camera and learn! Onto the Salty Dogs... What's up? Got a question for our Coasties? They are kind enough to answer all the questions! Take a soldier fishing! Nalu is a Godsend. He's put together one heck of a program! Are you a tuna newbie? Let us know! I am embarrassed to admit, I am! "I have registered on ifish, but I can't post on your classified ads. Why?" Well, I'll tell you! Please read the mandatory reading post on the top of each classified board. I don't know how folks miss that post. The members at ifish asked that they get to know newer members a bit, before they do business with you. Ifish is a community of folks with something in common. Ifish isn't ebay, or Craigs list. We are a group of trusting friends. Post a while... then use our boards! You must have 20 posts in order to use the classifieds! Then, on the way home, I got this excruciating pain in my seeing eye. If you've ever had a corneal abrasion of any sort, you'll know what I'm talking about. But- I didn't do anything to my eye! Dang, it hurt. Thought I'd take a look, before bedtime, and oh my.... I have a big bubble blister on my sclera. I'm off to the doc in Portland. Sigh. But I have to take care of this. It's my good eye! later... OK, now I have to have two eye surgeries. I'm going for the Guinness "World's most eye surgeries!" Don't you think I should? Pete says, "How's that for a poke in the eye?" I am so excited to introduce the new column, "The Seafarer" to ifish! It is written by a wonderful author, Francis Caldwell. I just adore this man's writing, and I'm so pleased to take part in his life's work! The archives will be stored, here. Want to be the top bidder on this baby? -then show up at ifishstock, check it out in action, and then bid, here! Honest to God, I don't have much time for "That's hot!" this week, but I'll give you a few things to ponder. Ifishstock is a go! Scan the main forum for all kinds of topics on ifishstock. What are you bringing to eat? and... get in on the secret! B-10 is heating up and the chinook fishing is hot! The Tuna Tournament is a go! Jen says, "Put that rod down!" And she's darn right! We have to, on occasion! Meet Francis Caldwell! Not only will he be at ifishstock, but he has a new column on ifish! I just adore this man! Now we have two columns by two super fishing heroes! Stan Fagerstrom and Francis Caldwell! We are so lucky! 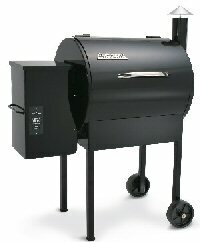 Bid on the Traeger Grill, here! Bid on the Water Ready Pontoon, here! Flyfishing: Rock Creek for Bows! A tangle of dark green swayed above me as I stared, a bit dizzy, in the breeze. So many colors! Sometimes softer vision is a nice thing. The black of the berries, the green of the tree, and the soft blue expanse of sky, behind it. Ever just get that happy feeling out of the blue? Dogs do. I know that, for sure! It's very infectious, too! This particular beautiful alder tree was heavy with green leaves. It broke up the maze of blackberry brush I had been following as I took Revvie and Kilch for a run in the field. I had been in search of the sweetest berries of them all as I worked my way back from fly fishing. It's tradition, you know. We can't go home till we find the best berry of them all. It's more of a challenge when you are feeding your pups. I dropped single berries into the hungry mouths like a Mama bird, feeding her young. One for Kilchis! One for Revvie! --and one for me! Mouth up, tails wagging, they waited their turn. I savored mine as it slid down and wet my parched throat. A little too long, I guess, because Kilchis gave out a demanding bark. But, Kilchis! There is nothing like a warmed-by-the-sun blackberry! So rich- you can almost taste whipped cream with it! I giggled as Rev gulped down her berry as labs do. Does she even taste it? Rev was just learning to enjoy this latest discovery. Food? Outside? She nosed into the bushes and was surprised when they bit back. I laughed and patted her head while telling her, a little too late, about the stickers. Poor pooch. I tossed my hair back in the gentle wind, and returned to my search. I came to an abrupt stop as I gazed upward into the alder. Even the fuzziest of eyesight couldn't miss this! Hanging high from between the soft green leaves of the alder tree was the thickest patch of ripe berries I'd ever seen! "Ohhhh, Revvie!" I gasped, The dogs eyes followed my gaze. Drool hung out of Rev's mouth. Their tails stopped their wag with anticipation. They were paying such close attention to the master of all treats! What a mighty hunter I was to them! This woman that could brave angry thorns and return with juicy treats! But... these berries tumbled through the tree as if they had magically grown right on the tree, itself! They hung there, teasingly, in the most picturesque way, as if taunting us from heaven, above! No thorns, but can I reach them? Deep, juicy succulent berries, just out of my fingers reach! The dogs eyes spotted them, and they whined. Kilchy let out another yip. These berries gracefully decorated the tree like Christmas, and were in deep contrast to the rich green leaves, and...without thorns! I reached high to snag one. They have got to be the sweetest of all, if I can't get to them! Right? We love this time of year. Berries galore! Of course, I spend so much time with the dogs, that I've learned some very simple, but important lessons. Oh, late summer! My favorite! But truthfully.. there is something sensual and sinfully delicious about blackberries on a summer evening! Heated by the sun, they just drip with sugar! When I preserve them, and throw them into a cobbler on a winters night, it brings summer warmth through the cold. It's no wonder that there are signs of all the animals in the woods here along the dusty trail. You have to watch your step. There are foot prints and droppings from all kinds of critters who have stopped to partake in this late summer treat. Bear, raccoons, deer, cats of all sizes, and then Rev, Kilchis, and me, too! Well, foot prints, at least! Today I have work to do. Ifishstock is tomorrow, but today, I have to clean up the garden, harvest some cucumbers and squash, and pick the blueberries, also hanging in clumps from green and beautiful vines. I just love the contrast of berries against green. It pickles me tink. I can't believe it, but I still have the most beautiful raspberries, and a bumper crop coming on, to boot! I even found a lone strawberry the other day! Soon, (and I'll be oh-so-glad!) ifishstock will be behind me, and my days will be more spent leisurely picking berries, fishing the late summer rivers for chinook salmon, and having coffee on my porch in the early morning sun. I can't say that I exactly look forward to surgery, but the excuse it creates for me to relax is refreshing, as I have full permission to do so. That's a good feeling! I'd better get on it, I suppose. Enough dreaming in the sun. I did get some of those berries, and they were, by far, the sweetest, the juiciest, thorn-less berries of the evening! I left enough to take a picture this morning. They are just so beautiful hanging there so out of place in the alder tree. Everything is so still this morning! There is a frigid draft coming in through the window. It's too cold so Close it! Summer mornings? Are they gone? Ifishstock is over, marking Falls approach! Last night, Andrew came upstairs while I was in the bath. I warned him before he entered the door. "I'm not dressed!" I shouted. He stayed at the door and seemed to notice my favorite bubble bath scent, "It smells good in here, like Christmas! Isn't it winter like? My room smells like Christmas, too!" Indeed it does! Winter is beginning to push in on us. First by taking over the warm mornings and evenings. Little by little, it will have its grip on the whole day! And all I can think about is those dark mornings when Bill leaves to hunt ducks, and I am left to wait for the sunrise where I have the sweet spots on the river to myself. Just Kilchis and I, doing what we love most! This year, I will catch a salmon on a fly. You watch! I adore the late afternoons when the sun falls strong against the blackberry brambles. The backs of my legs soak up the warmth as I stand in my shorts and try to store up that last sunlight that I know is leaving us. The only sound is the ping of each berry as it drops into my bucket and an occasional car that leaves a dust cloud across the river on the logging road. The smell of blackberry pies after the sun goes down is wonderful. Everyone is still hungry enough to eat it after a full plate of duck breast, brown rice and late summer squash. Perhaps soon we'll have a few treasured Fall chanterelle mushrooms. It's feasting time! I love how my passion for cooking changes and renews, each seasons start. From bbq to baking, the taste and anticipation grows. Yesterday I hopped in the canoe, out back. When it's calm, I can stare into the depths for hours and just float around. The river has changed so much and one of the deep salmon holes is even deeper, this year! There are points where I can't even see the bottom! But, yesterday there was a strong late day Nor'Western blowing and although I made it downstream to the hole I had targeted to fly fish, I couldn't position myself. -or remain positioned! It was maddeningly funny, because I'd get it just right in between blows, cast out, and darnit anyhow, if the wind wouldn't twirl me around backwards. Pheh! Kilchis heard the frustration in my voice, and swam out to 'save' me. Several times the bow of the canoe ran him over. I had no control! I couldn't stop laughing, even though my frustration was gaining on me! I finally gave up and headed back upstream. I almost made it, too! Thank God Bill came down to the river bank with Rev, just at just the right moment. I hopped out in the shallows and he pulled the canoe back up to point A. I'll try it again this morning, perhaps. The air is calm. I have time. Ifishstock is over, and it does indeed seem like everything is softer and more calm. I can breathe deeper. I can sleep more soundly. We are headed for nights of long winter naps. The days are meant for fishing, picking blackberries, and watering the ever withering flowers of late summer. I try so hard to keep them lush with fertilizer, but no matter what I do, they lose their fullness. I'm fighting a battle of seasons that I can't win. The wild tuna fishing season is going to come to an end, and the Salty Dog forum will sadly hush a bit. The Fall fishermen will take over the ramps. Long days will be spent slowly trolling the bay instead of the ocean-- and softer, more calm waters will prevail. I can already hear the laughter and shouting from one boat to another on a soft glassy bay... "Got any?" I think it will be a good season, too! Ifishstock was so fun. I have great memories, and the pictures are here. Enjoy them. I sure did! Francis Caldwell was able to make it to ifishstock and people enjoyed him so much! I had several people say it was the highlight of the party, to be able to visit with him! I've opened my window again, to feel that wonderful chill, before I hop into a warm shower. Afterwards, I'll have a cup of coffee on the deck, if the sun chooses to grace the table with sunshine. I have thank you cards to write to so many people! What a great feeling that is! How lucky we are at ifish, to have so many friends that love to fish, hunt, and boat! Ifish is my home and I'm thankful to have you all as my family. It hit yesterday with a vengeance. I was flat down on my back. It happens every time I overdo things. 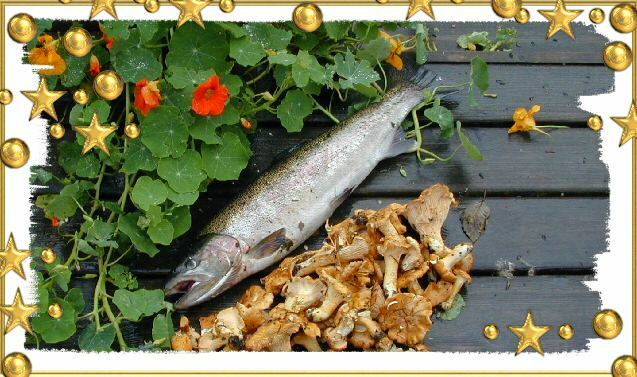 Ifishstock is a definite 'overdo!'. I had a fever, felt achy all over, and darnit of all darnits, I had an interview to do. This couldn't be! At shortly after 5:00 PM, I finally gave in and told Bill that if Francis showed up, that I just couldn't... and I weakly crawled back into bed. Defeat! Five minutes later, after expecting Mr. Caldwell "Monday or Tuesday", he pulled in the driveway! Isn't that the way life is? I couldn't help but giggle a bit, through my chills. Bill decided to direct he and his fully contained camper to the shady west end of the property by the river, and left for town. Bill had to pick up a tool for the installation of his new dishwasher. I couldn't take it! If you don't know Francis like I know Francis, this man is full of salty tales, recommendations of good books to read, and besides, he's got the cutest little dog I've ever seen! Her name is Tulip. I have her business card! I had to get up to say hi! So, I spent the next hour of my evening, sitting cross legged in the dew touched grass, wearing my floppy house dress. To top off the outfit, I was sporting my fleece Mustad jacket, my warmest wooly socks and tennis shoes. I must have looked pretty darn silly, for sure! His stories raced my heart. Pirates and big seas and chases, oh my! Later, Andrew and David pulled up from town with dinner, and I retreated to the kitchen. Francis followed a bit later. We gathered in the warmth of the living room to continue our visit. He's such fun to have around! After a long night's nap, I feel much better today. I think I can sustain the interview and perhaps even travel out to the river to throw around a couple flies. Off to the showers, I go. Francis is not up, yet. There is a Fall chill to the air. I've got to hit the river before the sunshine hits the glassy water and warms up the valley. Then it will be time for me to tell the tall and salty story... of ifish.net. I can't wait! I haven't been on the water in ages! Hey! Want a house on a slough that is awesome? My girlfriend, Kim, is selling her house. The link is here. What a great place to fish! Kim and Tom fixed up that house so beautifully, and right on the water? Wow! I'd die to have this piece of heaven, and it is hot! What a great bed and breakfast this would make! Check out the pinned topics on the main forum, this week! Make sure you get your final bid in, on the Traeger Grill and/or the Water Ready Pontoon! They end at noon on Labor Day, and benefit NSIA. Here's a tip on how to use ifish. Start by typing in www.ifish.net and hit enter. Click on the discussion board, on this link. Thousands of people do this exact thing, every day- sometimes multiple times a day! I know! I read my page stats! You can find that link in the top left hand corner with the big bolded "Ifish Discussion Board" logo. If you want to register so that you can participate, search, and see more photos, click here. Follow the instructions and wait for Pete to get home from work to finalize your registration. Then, choose the forum that interests you. Once there, if you'll look to the far right, you'll see page views. The higher the view, the more popular the thread is. You'll also find a column for how many replies a topic has had. For instance, I'm fishing the Nehalem today. (I think-- but let's say I am. Therefore, I want to find reports for the Nehalem. I can either scan down the topics, or use the search feature, top right. If I use the search feature, I'd type in Nehalem and then click on "Go Fish!" Try it! You'll be amazed at the return. I'm teaching you how to do what I've been doing, lately, every Friday, as today I don't have time to do it until this evening! Maybe I'll catch some awesome salmon and be part of what's hot! I hope so! I've got my seasonal lipstick for Fall that will do the trick and I can't wait to try it! I've also got my cozy Danner socks and my new pink rod! No way can I miss!